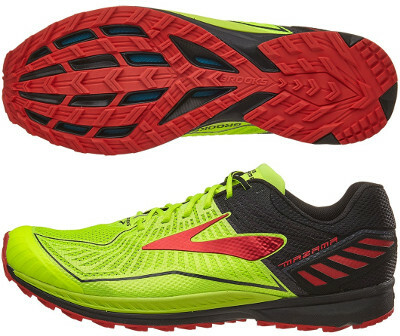 Brooks Mazama are neutral trail running shoes. The agile Brooks Mazama is the new trail running model from the american brand to fill the gap between the popular Cascadia 11 and minimal PureGrit 5, a great choice to run fast on dirt tracks and non-technical terrains. BioMoGo DNA midsole provides enough cushioning with rather hard feeling. Forefoot plate not only protects against sharp objects but also encourages a quicker toe-off. Outsole design is very interesting with decoupled midfoot and large holes in forefoot for more flexibility and better adaptation to all kind of terrains. Multidirectional (and not very deep) lugs provide improved traction up and downhill although raise some concerns about grip on more technical (wet and rocky) surfaces.